The world was upside down. Gazing upward, I peered into the deep blue of a starless pre-dawn sky, seeing for empty light years. Below it was the twinkling surface of the lapping caribbean sea. My eyes adjusted as the sun's rays crested and reflected over the hillside to spread down the slope behind me. The deepest blue began to fade towards light. The silence was broken by an unseen splash. And then another. Like clockwork, the tarpon awoke. The lightening sky allowed the silhouetting of baitfish. It was breakfast time. We had to act fast before they became too keyed-in. After twenty minutes of refusals on dark patterns we switched it up as dawn officially broke. 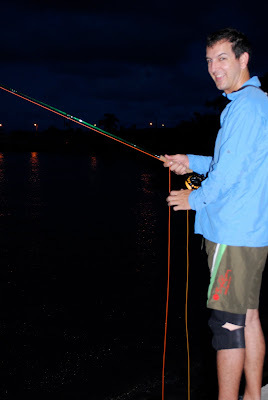 Wayne's first cast with a slimmed-down white fly was a sure thing. The fish took Wayne into his backing on its first run. This was his first hookup with a tarpon. Five minutes of tutorials and the backing knot has been regained, only to slip back into the water during the tug of war. An unnerving and loud SNAP echoed off of the stone wall behind us. The backing knot had failed. Ninety feet of fluorescent orange fly line was claimed by Poseidon. With our tails between our legs, I rigged up my 10wt. We still had 30 minutes before we had to leave to make work on time. I casted into a boiling mass of feeding fish and was rewarded with an acrobatic display of leaps and cartwheels. As pterodactyl-like frigates soared overhead, I fought and subdued the fish in the fresh morning light, and let her go on her way after a quick picture. We gathered our gear and headed to work, reflecting on the ability to catch a tarpon before heading to our day jobs.